Music performed on ancient Aztek and Mayan instruments. 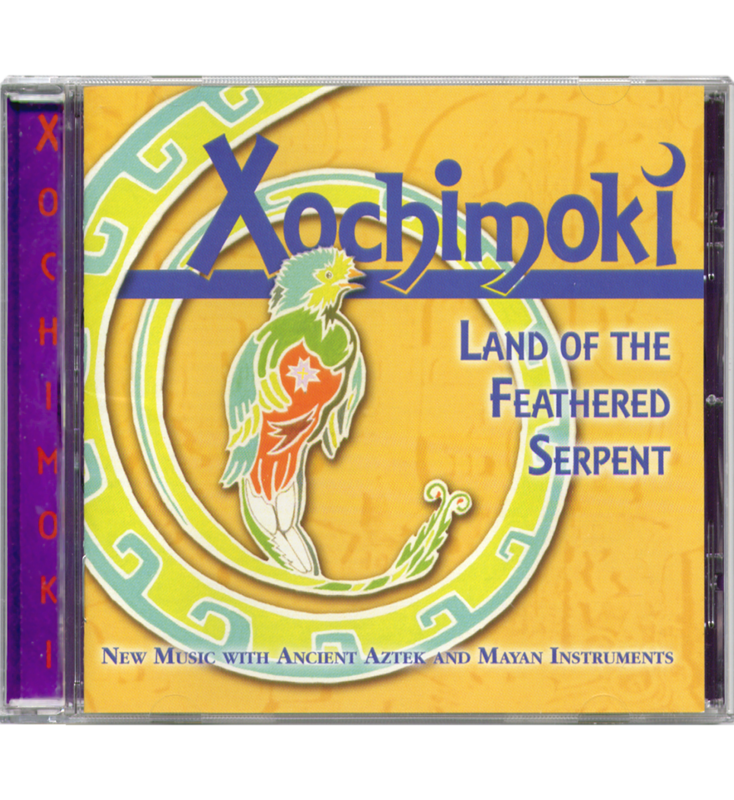 Xochimoki's new CD, "Land of the Feathered Serpent" has over an hour of music performed on ancient Aztek and Mayan instruments. It has been compiled from the best of our recordings in the 1980's, previously only available on cassette. It also includes music that was created for an animated film by Patricia Amlin entitled "Popol Vuh - The Creation Myth of the Maya" (1990) that has aired many times on PBS. All of the music has been re-edited and digitally remastered, and some here-to-fore unreleased music is also part of this release. 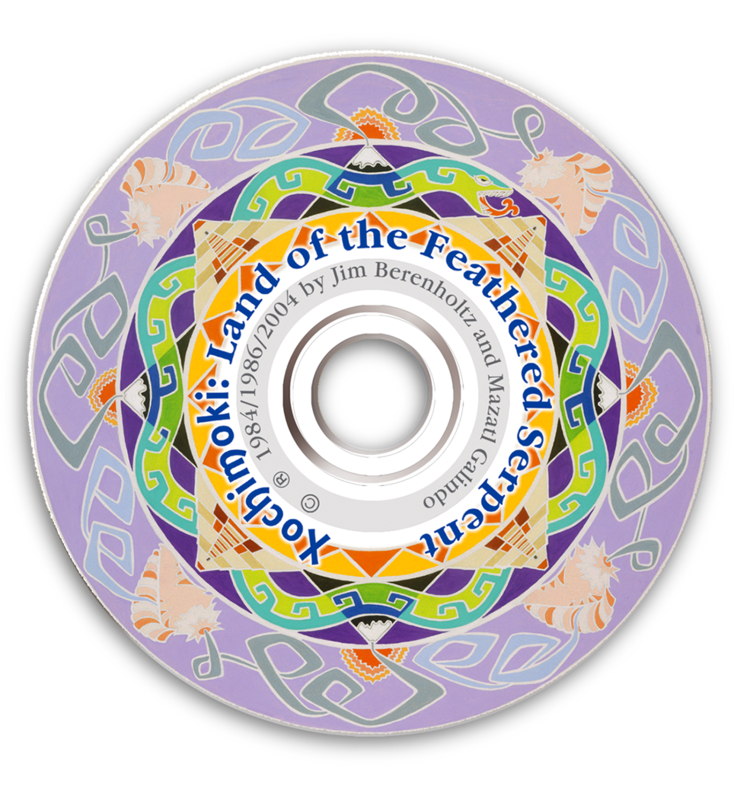 The CD, booklet, and covers are illustrated with original artwork based on pre-Columbian motifs. The highly informative booklet is in both English and Spanish, and includes a Nahuatl and Mayan glossary of terms . Titles of various tracks on the CD refer to ancient Mayan ceremonial centers, sacred Aztek volcanoes, cosmologies and cultural traditions of the native peoples of Mesoamerica. The music was inspired through the living experience of connection to these cultural/spiritual roots. In Aztek, Mayan and most other Native American traditions, the sacred Four Directions (north, east, south, west) play an extremely important role in ritual and cosmology. Naui Ollin literally means “Four Movement”, and is the name of the short invocational dance done before all other dances in the Aztek dance tradition. Naui Ollin is also the symbol at the center of the Aztek Calendar, and denotes the present world cycle that is now concluding. This music is arranged in four distinct movements (tracks 2 thru 5), and is performed with a variety of tlapitzallis, quiquiztlis, huehuetls, teponaztlis, teponaztontlis, ayakaxtlis, tzitzillis, tenavares, and Yaqui water drums. Recorded by Baird Banner at Kludgit Sound Studios, Cerrillos, NM (1984). The beautiful snow-capped volcano of Popokatepetl rises above the central valley of Mexico. In ancient times, when the sky was unpolluted, it was often seen towering in the distance beyond the glimmering temples and pyramids of Mexiko-Tenochtitlan. Still today it evokes awe and admiration as a site associated with many sacred stories, and as a bridge between Earth and Heaven. This music is performed with ancient instruments of both Mesoamerica and South America - tlapitzalli, quiquiztli, kena, and zampoñas (similar ancient panpipes were played in Mesoamerica). Recorded in Taos, New Mexico (1986). This is the full name given by the Nahuatl-speaking people to the earliest known civilization of Mesoamerica, the Olmek. As the name indicates, they were considered to be Keepers of the History, the “mekatl” being a cord with knots tied into it as a means of calculating and recording events from past to future, and of measuring time and space. Yet though the Olmek were the source of the sophisticated mathematical and cosmological systems upon which later Mesoamerican civilizations were based, their own origins remain a mystery. An exquisitely carved monolithic stone from the Olmek ceremonial site of La Venta may provide some clues, from which comes the inspiration for this piece. The music is arranged in three distinct movements that attempt to tell the enigmatic story of the monolith. The first movement (track 7) begins in mystery, like the right side of the monolith, which has no visible carving, but from which the mekatl cord emerges. Here are imagined the unknown origins and migrations of the Olmek. The primordial sounds of a watery world full of swamp-dwelling creatures is portrayed using rainsticks, tzitzillis, omichikahuaztlis made from gourds and armadillo shells, small stones, small gourds used as wind instruments, and giant bamboo flutes. Recorded at Kludgit Sound Studios, Cerrillos, NM (1984). The second movement (track 8) is set deep in the jungle, a world that is rich and alive with the many sounds of insects and other inhabitants. It corresponds to the front-facing facade of the monolith, which depicts a spiritually awakened Olmek man sitting cross-legged with the mekatl cord passing through his hands. “What does he know that we don’t?”, the music asks. We hear bamboo trumpets and a variety of tlapitzallis set in a musical environment created by bowed cymbals and “humming bees” (made of paper and rubber). The third movement (track 9) tells the story of the left side of the monolith, the coming of the Maya to the land of the Olmek. The mekatl cord wraps around to the left, leading to a very refined and androgenous appearing Mayan person with an expression of perfect serenity. In physical type this figure is completely unlike the bold and stocky figure on the front of the stone, whom he/she points back to. The music suggests a voyage across the sea with ocean sounds and the vocal drones of great numbers arriving, accompanied by an Olmek triple tlapitzalli, Mayan boxel ak, and ceramic flutes and rattles from the ceremonial Mayan island of Jaina. The ketzal is the sacred trogon bird of the Maya and Aztek people, and is a symbol of that which is most beautiful in life. Papalotl is the butterfly, a symbol of happiness. Ketzalpapalotl represents the beauty of happiness, and is expressed here in music for dance. It is performed with Yaqui water drums, ceramic and gourd ayakaxtlis, and tlapitzalli. Recorded by Bob Farwell, Berkeley, CA (1986). In Nahuatl the wise people and teachers of spirituality and culture are known as the tlahmatini. This music pays homage to their gifts, and is performed with tlapitzallis. Recorded by Bob Farwell, Berkeley, CA (1986). The Feathered Serpent (Ketzalkoatl in Nahuatl, Kukulkan in Maya) is the central cosmological symbol of Mesoamerica, representing the union of opposites. The Feathered Serpent is also an enlightened one who has incarnated at different times and places throughout Mesoamerica. This music is offered in tribute to the great culture hero and giftbringer of Toltek and Maya tradition. It is performed with a variety of tlapitzallis, teponaztontlis and ayakaxtlis. Recorded at Kludgit Sound Studios, Cerrillos, NM (1984). The sacred ballgame was a very important part of Aztek, Mayan and other Mesoamerican cultures. It had cosmological significance pertaining to the cycles of the sun, moon, planets and stars, and the interplay of shadow and light. This music is intended to suggest images of the highly ritualized sport. It is performed with tlapitzalli, teponaztlis and teponaztontlis. Recorded by Bob Farwell, Berkeley, CA (1986). These brothers are the central figures and heroes in the Popol Vuh, the Mayan Book of Creation. Their many adventures and trials culminate in their journey to Xibalba, where they play the sacred ballgame with the Lords of the Underworld. Ultimately their story is one of regeneration, transformation and redemption. Their relationship is reflected upon in this music, performed with tlapitzallis. Recorded by Bob Farwell, Berkeley, CA (1986). Tlalokan is the verdant, heavenly paradise of Tlalok, who represents rain. It is a playful world full of abundance and pleasure that is suggested by this music. The instruments heard are akatecciztli, teponaztli, Yaqui water drums, Raramuri hoop drum, and ayakaxtlis. Recorded by Bob Farwell, Berkeley, CA (1986). Tulum is the name of an ancient Maya ceremonial site along the Caribbean coast of the Yukatan peninsula. This music is suggestive of that place, and is performed with modern ocarinas in the forms of a dolphin and a whale. Recorded by Phil Gall at Mudshark Studios, Flagstaff, AZ (1986). The Mayan Underworld has many realms,some of which are suggested by this music with bowed cymbals, huehuetl, voices, quiquiztli, and toyos. Recorded by Bob Farwell, Berkeley, CA (1986). This is the name of an ancient ceremonial center of the Classic Maya. It is along the Usamacinta River between what today are Mexico and Guatemala, and is surrounded by rainforest. The music is performed with ceramic ayakaxtli and tlapitzalli from the island of Jaina, teponaztlis, tunkuls, tzitzillis, a Totonak slide flute, akatecciztli and an ometlapitzalli. Recorded at Kludgit Sound Studios, Cerrillos, NM (1984). Nah Chan is the original Maya name for Palenque, which is perhaps the most exquisite of all the ceremonial centers of the Classic Maya. To reach Nah Chan through the rainforest a trail leads along a beautiful series of cascades. There, howler monkeys sound in the treetops above the eerie drone of cicadas and other insects. Birds shriek, and small creatures scurry through the underbrush. All this is musically portrayed with rainsticks, cuicas, bowed cymbals, “humming bees”, tlapitzallis, chikahuaztli, and the human voice. Emerging out of this chorus of nature a chant begins, inspired by a melody “remembered” inside the Temple of the Sun. The listener has now entered the sacred ceremonial complex of Nah Chan, and is witness to an ancient ritual honoring the powers of creation. Song is accompanied by akatecciztli, ayakaxtli and Yaqui water drums. Set deep into the Lakandon rainforest near Yaxchilan, this Mayan ceremonial center houses some of Mesoamerica’s most exquisite colored murals. Dancers and musicians are depicted playing hum tah, tlapitzalli, huehuetl, teponaztli, boxel ak, tunkul, ayakaxtli, tenavares and tzitzilli. This piece is inspired by the murals, and uses the same instruments. It concludes in a second movement (track 22) with tetzilakatl accompanied by an ocelotlapitzalli (jaguar flute) playing a longful melody. Recorded at Kludgit Sound Studios, Cerrillos, NM (1984).